The market is segmented by type (surgical, rehabilitative robots, daily care & transportation robots) and geography. The global medical robotic system market is expected to register a CAGR over 20% during the forecast period of 2019-2024. AI-assisted diagnosis is expected to take over the present traditional diagnosis methods. Machines and other AI platforms are being built in a way that they observe the patterns of medication, and further learn the methods in real-time. The rise in antibiotic-resistant bacteria and outbreaks of deadly infections, such as Ebola, have led to increasing usage of sanitation and disinfection robots for disinfecting surfaces. Their capability to disinfect a room of any bacteria and virus within minutes has been remarkable aspect. Cardiovascular diseases have been the leading cause of death, accounting for nearly 17.3 million deaths per year, and the number is estimated to cross 23.6 million by 2030. The increasing incidence of cardiac diseases worldwide has created the demand for the robot-assisted surgery, making it a cutting-edge procedure. However, the high cost of installation and maintenance is a major barrier for the medical robotics market. The cost of medical robotic products, such as robotic surgical systems, ranges from USD 1 million to USD 2.5 million per unit. Another factor is the device adaptation time - a surgeon needs to perform a minimum of 150 surgical procedures to completely get used to the adaption of these devices. A medical robotic system ensures precision and is used for remotely controlled, minimally-invasive procedures. The current systems comprise of computer-controlled electromechanical devices that work in response to controls manipulated by the surgeons. Performing operative procedures with the assistance of robotic technology is referred to as medical robotic systems. The market is segmented by type as surgical, rehabilitative robots, daily care & transportation robots, pharma automation robots, disinfection robots. In recent years, health care facilities and hospitals have turned to robots, or enhanced environmental disinfection systems that feature hydrogen peroxide vapor (HPV) or ultraviolet-C (UV-C) light, to complement infection control protocols already in place to battle multi-drug-resistant organisms. 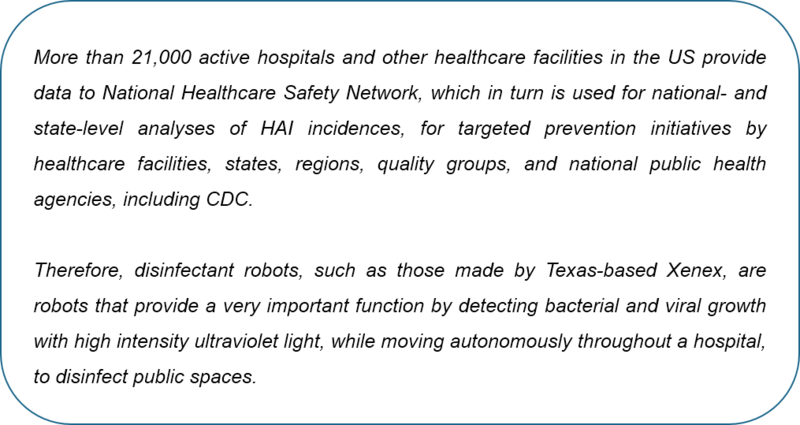 The growth of the disinfection robots can be attributed to the ongoing fight against hospital-acquired infections (HAIs). According to the Centers for Disease Control and Prevention, 1 in 25 hospital patients had at least one HAI and 75,000 hospital patients die from them each year. Therefore, many health care facilities and hospitals are adopting “robots” to support methicillin-resistant staphylococcus aureus (MRSA), combat clostridium difficile (C. diff) and more as pathogens mutate to resist disinfectants and antibiotics. As the market gains acceptance, retailers need to accentuate on improving their product features using advanced sensors and technologies, to progress on the proficiency of the disinfection robots. The growing demand for the advance healthcare infrastructure system in APAC is expected to witness a healthy growth during the forecast period. 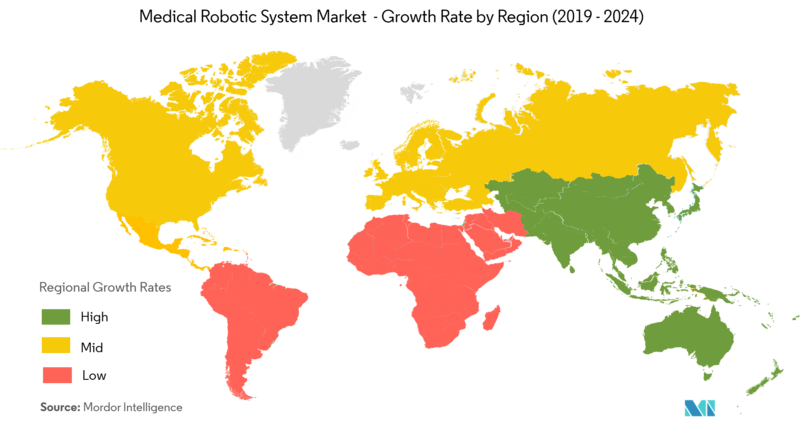 China contributes to a majority of market share in the region. 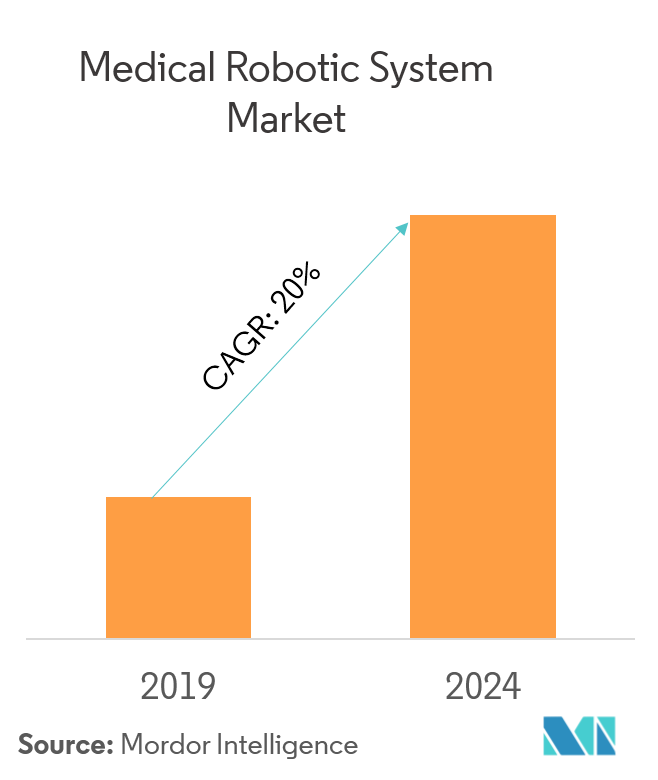 Chinese demand for medical robots is mainly driven by the increasing adoption of instrument-based services. The demand is also supported by other factors, such as, lack of skilled physiotherapists and caretakers. Healthcare spending in Korea has shot up dramatically, but it still accounts for only 6.6% of the GDP. The emergence of medical robots, such as, Revo-I, which will be commercialized by the end of 2017, is expected to drive the demand. The country has been actively promoting personal robotics, and focusing on surpassing other countries in the Asia-pacific in care assistance and service robots. Ageing of South Korea’s population, and massive government focus on the robotics industry is expected to impact the South Korean medical robots market. The green packaging market is moderately competitive and consists of some major players. In terms of market share, few of the major players currently dominate the market. 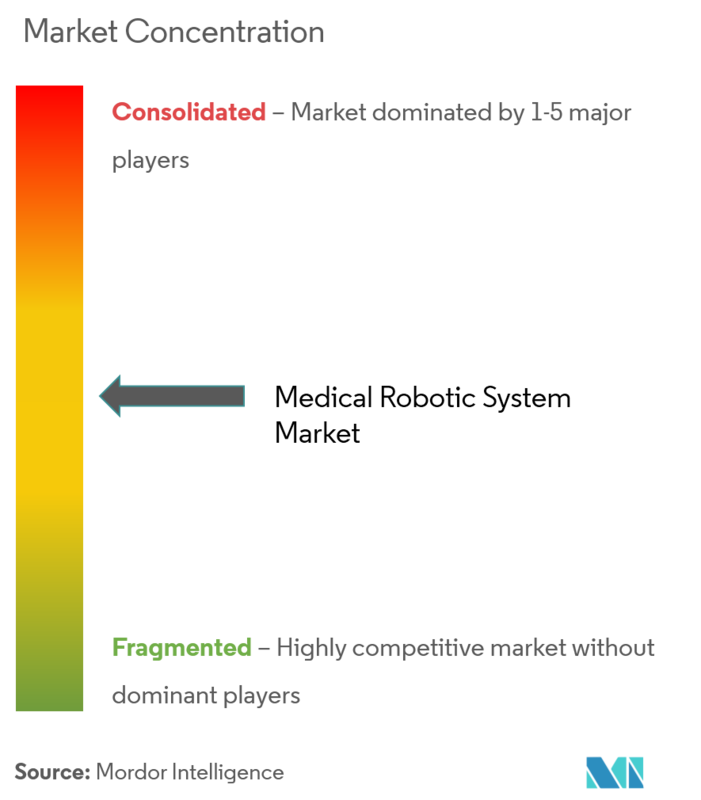 These major players are engaged in innovating and forming strategical partnerships for innovating and providing advanced solutions to withstand increasing competition in the market. For instance, Medrobotics in October 2018, announced the first sale of their Flex Robotic System for gastroenterology applicationsin Europe. The hospital, A.O. Universitaria Città della Salute e della Scienza di Torino, was the first European facility to offer Scarfree interventional endoscopic procedures.